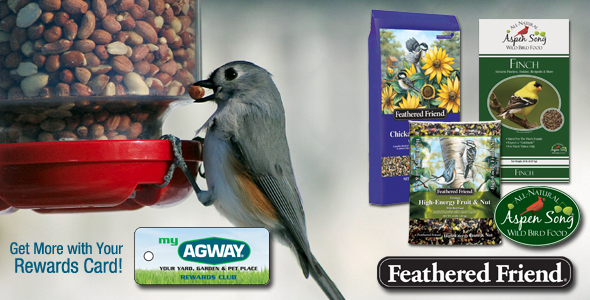 myAGWAY Rewards Customers earn $10 Coupons with the Feathered Friend Program! Ask to become a Rewards Club member at your local myAGWAY. Every time you purchase a Feathered Friend wild bird seed product, myAGWAY will credit your Rewards Club account with lb quantity you purchased. When you reach 500 lbs purchased, you will receive a $10 coupon to use on your next visit. Your membership also allows you to earn points towards bonus store coupons. With every 350 points, you will receive a $5 Reward. Click here for details.